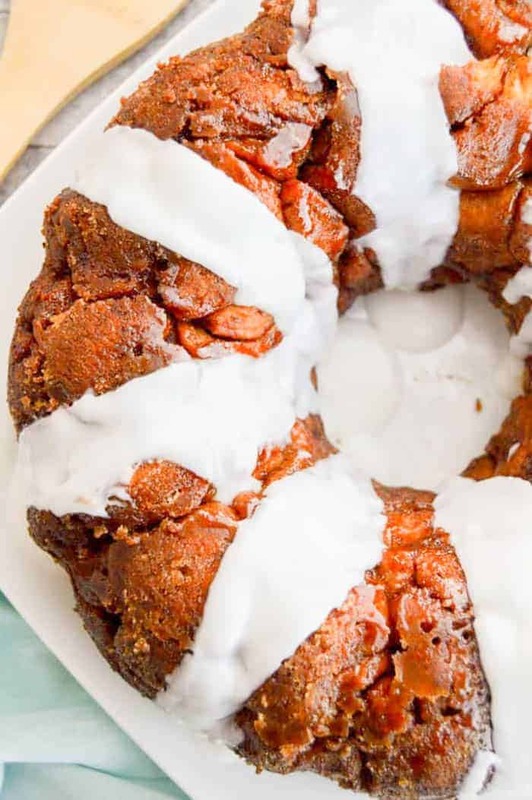 Breakfast or dessert, you pick, This Cinnamon Roll Monkey Bread is easy to make and so good you may just want it for both. 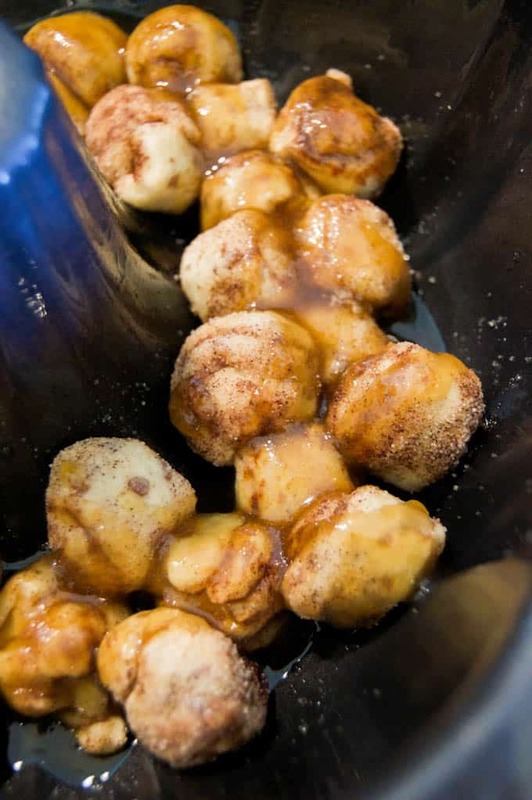 Simply cut and pint your cinnamon rolls then roll them in a cinnamon sugar mix. Baked and then drizzled with icing. 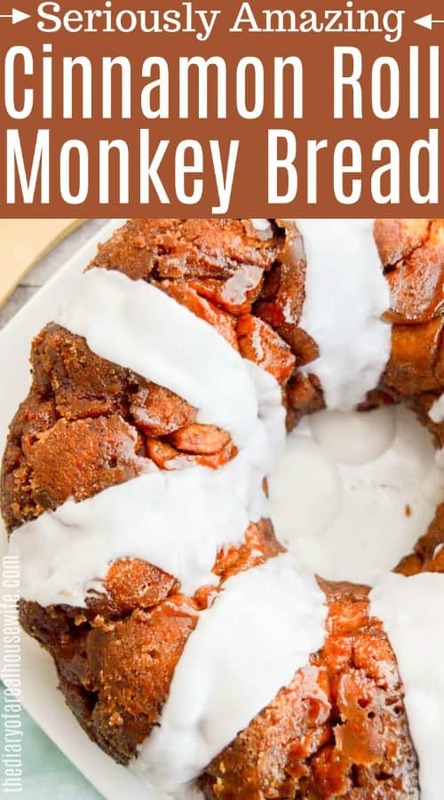 Not only was this Cinnamon Roll Monkey Bread delicious it was also easier to make then homemade monkey bread! No mixing dough at all I just used three cans of cinnamon rolls! I cut them into small pieces to make lots of mini rolls, and then put it together just like you would monkey bread. After it’s cooked pour on that icing! It’s so easy to make and it’s so good. Step one: Get started by preheating your oven and then grease a bundt cake pan and set aside. Step two: Microwave butter and brown sugar for 1 minute. Remove it from the microwave and use a fork to mix well until most of the sugar is dissolved. Step three: Cut each cinnamon roll into 4 pieces. Pinch and roll to form little mini cinnamon rolls. Do this to each cinnamon roll and set aside. Step four: In a separate bowl mix together sugar and cinnamon. 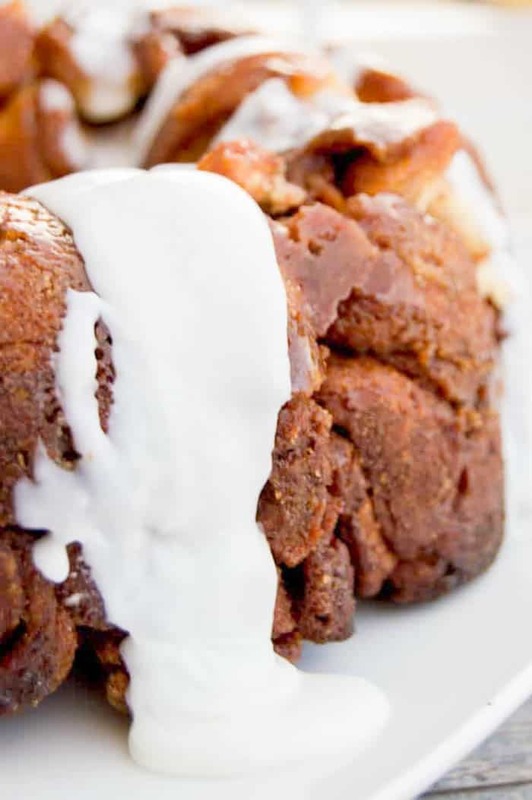 Roll each little cinnamon roll in the cinnamon sugar then place it into the bundt cake pan. Step five: Once the first layer is full add the butter-sugar mix then add another layer of cinnamon rolls and repeat until you are out of cinnamon rolls. I made three layers one with each can. Step six: Bake in the oven and then remove from the oven and let it sit for about 5 minutes then turn upside down on a plate and tap on the pan. Drizzle with icing. Serve and enjoy! Preheat the oven to 400 degrees F. Grease a bundt cake pan and set aside. In a bowl, microwave butter and brown sugar for 1 minute. Mix well until most of the sugar is dissolved. Cut each cinnamon roll into 4 pieces. Pinch and roll to form little mini cinnamon rolls. Do this to each cinnamon roll and set aside. Bake for 20-25 minutes. Remove from the oven let sit for about 5 minutes then turn upside down on a plate and tap on the pan. Drizzle with icing. Serve and enjoy! You had me at no mixing dough. The last time I tried that, it turned out BAD!